Notes The course takes place in a neon-lit city. Star City is an area in the Future Fun Land and appears in the games Diddy Kong Racing and its remake, Diddy Kong Racing DS. 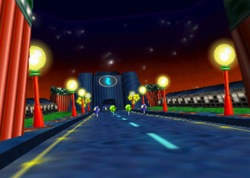 At the start, the player will go into a rainbow-colored tunnel and onto a long, curved bridge. If the player falls off the bridge, he or she will have to go all the way around to get back on it. Otherwise, they meet a dead-end. At the end of the bridge there is a city area with rotating giant rings before to quit the city. The city area is made up only of 90° corners, requiring tight handling to negotiate them. There are some Zippers that are very much off road if the player uses the plane. If the player uses a blue balloon at the very top of the slope, they will career to the bottom. In the Nintendo DS remake, the tunnel after the bridge if the player stayed on it has a different angle downwards to the city. Also, if the player falls off of the bridge, the dead-end is instead a small tunnel leading the racer to the city where a fork in the road is seen. The giant rings are replaced by a fountain, however they still appear during Balloon Pop Challenges. This page was last edited on January 1, 2019, at 23:55.